357 Beacon is located on the south side of Beacon, between Fairfield and Gloucester, with 355 Beacon to the east and 359 Beacon to the west. 357 Beacon was designed by architect Carl Fehmer and built in 1885-1886 by James Smith, mason, one of two contiguous houses (357-359 Beacon) designed as a symmetrical pair. 357-359 Beacon were built on a 38 foot wide lot purchased by Henry Rogers Dalton on June 3, 1885, from Augustus N. Loring, who had assembled it from two separate lots, one 24 feet wide and the other 14 feet wide. Both were part of one of several parcels originally purchased from the Boston Water Power Company on January 29, 1866, by a real estate investment trust formed by John Templeman Coolidge, Franklin Evans, and Charles Henry Parker. The trust had subdivided the property into lots, which it sold to investors and builders, who then frequently resold the lots to others. Click her for an index to the deeds for 357 Beacon. Henry Dalton built his home on the eastern 20 feet of the lot at 357 Beacon. He is shown as the owner on the original building permit application, dated June 8, 1885. On August 14, 1885, he sold the western 18 feet of the original lot to his brother, Charles Henry Dalton. Charles Dalton and his wife, Mary (McGregor) Dalton, lived at 33 Commonwealth; on April 3, 1886, he sold the 18 foot lot to Albert Stone, who built his home at 359 Beacon. 357 Beacon was completed by the 1885-1886 winter season and Henry Dalton and his wife, Florence (Chapman) Dalton, made it their home. 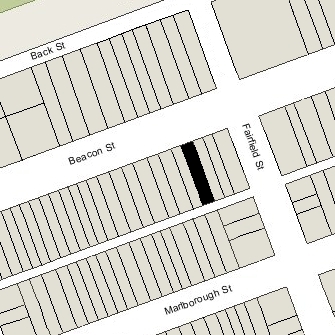 They previously had lived at 288 Marlborough. He was an insurance broker. 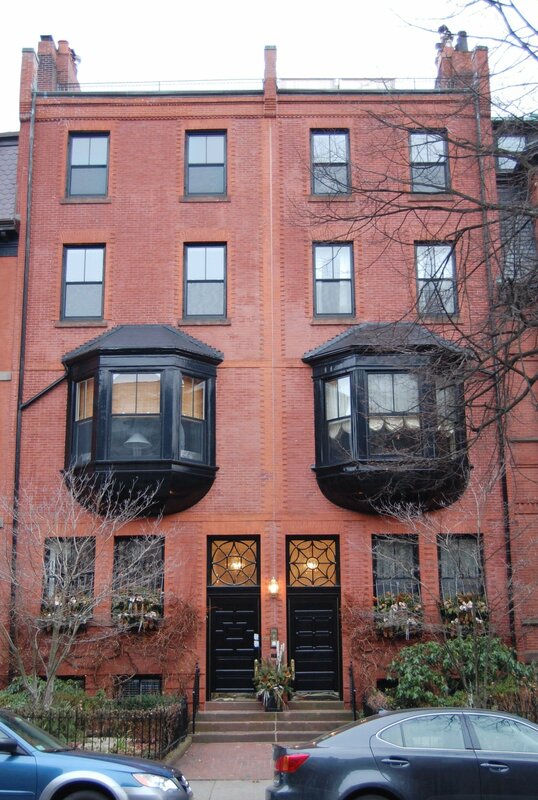 The Daltons continued to live at 357 Beacon during the 1886-1887 winter season, but moved thereafter to 507 Beacon. On May 2, 1887, 357 Beacon was purchased from Henry Dalton by Mary Elizabeth (Fearing) Leeds, widow of merchant James Leeds, Jr., and their son, Herbert Corey Leeds. They purchased the house as trustees of a trust established under James Leeds’s will. They had lived at 188 Beacon in 1885. 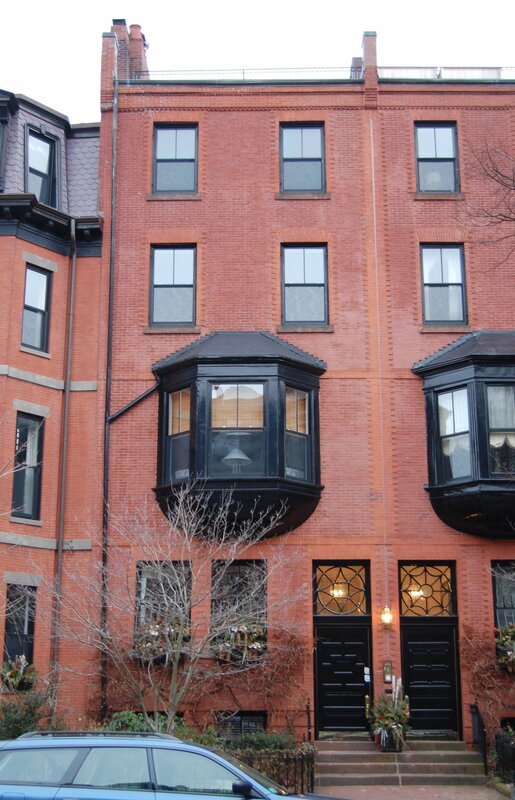 Mary Leeds continued to live at 358 Beacon during the 1891-1892 winter season, but then lived elsewhere for the next two seasons, probably traveling abroad. Herbert Leeds lived moved at about the same time to 15 Blagden. He later would become a noted yachtsman, author, and designer of golf clubs. During the 1892-1893 winter season, 357 Beacon was the home of cotton manufacturer John Whittemore Farwell and his wife, Ruby Frances (Howe) Farwell. They also maintained a home in Melrose. By the 1893-1894 season, the had moved to 457 Beacon. During the 1893-1894 winter season, 357 Beacon was the home of merchant Benjamin Loring Young and his wife, Charlotte (Hubbard) Young. During the previous season, they had lived at 227 Beacon. They also maintained a home in Weston. By 1894-1895 season, they had moved to 254 Beacon. By the 1894-1895 winter season, Mary Leeds was living at 357 Beacon once again. She continued to live there during the 1895-1896 season, but moved thereafter. The house was not listed in the 1897 Blue Book. During the 1897-1898 winter season, 357 Beacon was the Boston home of William Croad Lovering, a textile manufacturer from Taunton who had been elected to Congress in 1896. He was a widower. In 1897, he had lived at 217 Beacon. On September 29, 1898, 357 Beacon was purchased from Mary Leeds’s trust by two trusts established for the benefit of Caroline James (Young) Stevenson, the wife of Robert Hooper Stevenson, one trust established under the will of her mother, Caroline (James) Young, the wife of Rev. Alexander Young, and the other under the will of her grandmother’s brother, Benjamin Loring (Rev. Alexander Young was the son of Alexander Young and Mary (Loring) Young, the brother of Benjamin Loring). 357 Beacon became the home of Robert Hooper Stevenson and Caroline James (Young) Stevenson. They previously had lived at 9 Exeter. They also maintained a home in Nahant. Caroline (Young) Stevenson was the sister of Benjamin Loring Young, who had lived at 357 Beacon with his wife, Charlotte, during the 1893-1894 winter season. Robert Stevenson was treasurer of the Lowell Machine Company. He served in the Civil War and was brevetted a Brigadier General. Caroline Stevenson died in 1922, and on June 12, 1922, the trustees for her the two trusts transferred 357 Beacon to a trust established under her will. Robert Stevenson continued to live there until his death in May of 1928. On August 21, 1928, 357 Beacon was purchased from the trust established under Caroline Stevenson’s will by Herman H. Cleval, and on August 24, 1928, it was acquired from him by Madeline T. Roach. On November 27, 1929, Frederick L. Sullivan, holder of a mortgage from Madeline Roach, foreclosed and took possession of the property, and on November 30, 1929, it was acquired from him by Adelard Monet, a dealer in second hand furniture. 357 Beacon became the home of Adelard Monet and his wife, Eugenie (Asselin) Monet. The previously had lived at 1 Arlington Terrace. They operated 357 Beacon as a lodging house. Eugenie Monet died in 1933. In April of 1933, Adelard Monet acquired 377 Beacon, which he also operated as a lodging house. On August 17, 1934, the Union Savings Bank of Boston foreclosed on its mortgage on 357 Beacon and took possession of the property. Adelard Monet continued to live at 357 Beacon and to operate both it and 377 Beacon as as lodging houses. He lived at 357 Beacon until about 1939. By 1940, he had moved to 377 Beacon. On July 11, 1940, 357 Beacon was acquired from the Union Savings Bank by John Philip Manning, a salesman, and his wife, Marion C. (McDonald) Dutton Manning, who operated it as a lodging house. They owned and lived at 359 Beacon, which they also operated as a lodging house. 357-359 Beacon continued to be operated as lodging houses. 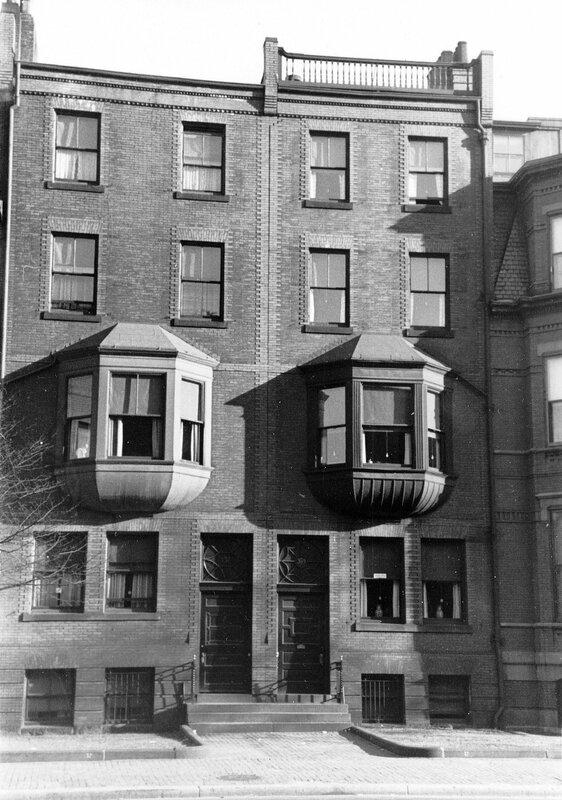 The legal occupancy of 357 Beacon, however, was as a single-family dwelling.